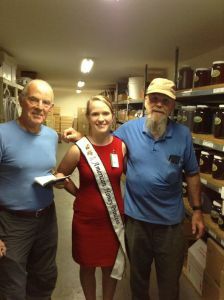 Meet Mariah Seller, PCBA’s own Honey Queen. Queen Mariah will serve as the Honey Queen in 2015 through 2016. Her goal is to help introduce the public to the importance of bees in our community and the benefits of honey. She is our ambassador, a communicator, and spokesperson. (If you were lucky, you might have worked the State Fair booth with her this year.) Mariah is proud to represent the PCBA and she is looking forward to working with schools and community groups to introduce them to the world of bees and beekeeping. Mariah is a country girl. She comes to us via Minnesota and the University of Puget Sound (UPS). In Minnesota, Mariah lives on a farm and keeps bees. 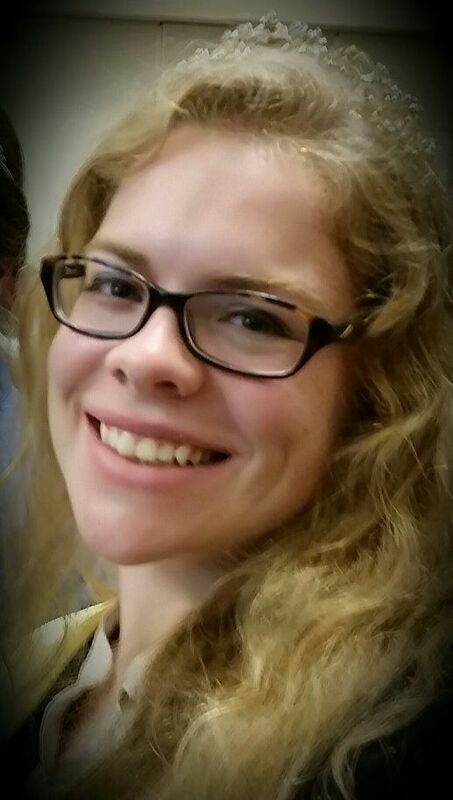 Presently, she is finishing her junior year at UPS, majoring in chemistry. She hopes to apply her knowledge to national agriculture after she graduates. She is an experienced beekeeper. She learned from her mother and was lucky to attend classes given by Marla Spivak at the University of Minnesota. On the UPS campus she is a third year member of the University of Puget Sound Hiveminders, a beekeeping club. The club keeps three hives on the top of the biology building. While with the club, Mariah earned her Apprenticeship and is now working on her Journeyman standing. If you see her at meetings, please come up and introduce yourself. 2014 PCBA Honey Queen: All Hail Queen Elizabeth! 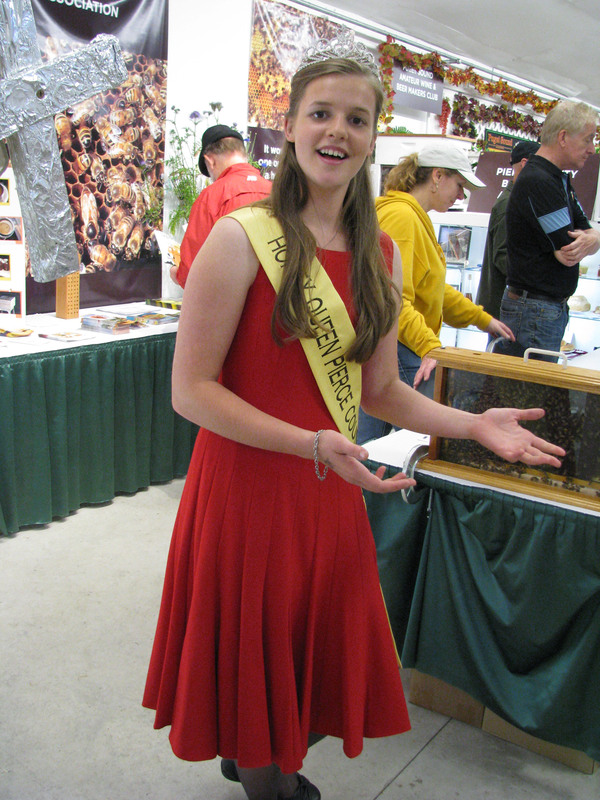 Elizabeth Kroker was recently crowned as the Pierce County Beekeepers Association Honey Queen for 2014/2015. At the August 25, 2014 General Meeting Elizabeth received her crown and introduced herself to the membership. Elizabeth is 18 years old and lives with her family in Auburn. She recently received her Apprentice status with PCBA. Elizabeth spends her working hours at a commercial farm where she’s been involved with everything from seeding to harvest. She is enthralled by the honeybee-agriculture connection. She has also been involved with Sheep to Shawl projects where individuals learn all aspects of wool preparation from shearing to dying to carding, spinning, and knitting. PCBA welcomes Queen Elizabeth and looks forward to getting to know her better. We are also proud that she will represent PCBA in the community as a honeybee and honey ambassador, spokesperson, and educator. 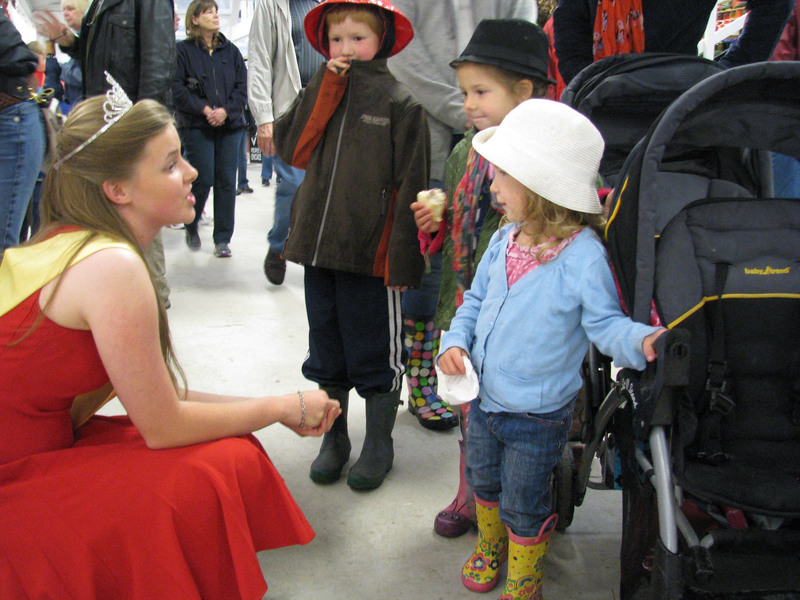 In May 2013, Sarah Jackson became PCBA’s and Washington State’s first Honey Queen. 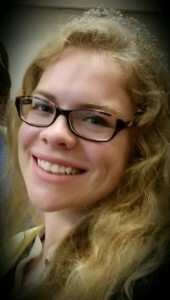 Sarah was a 2013 study grant recipient. During her service year, Queen Sarah represented PCBA at the WA State Fair in Sept. 2013, and the WASBA Conference in October. She held the position through Spring 2014. 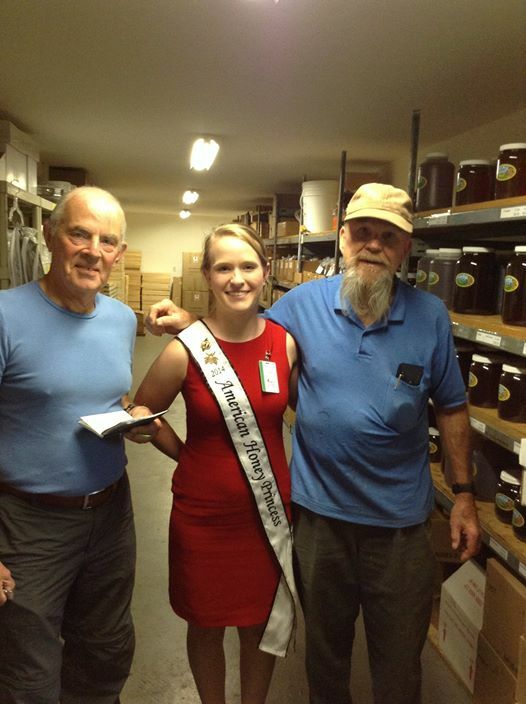 The PBCA Honey Queen program will also act as a launching pad for a State Honey Queen program through the WASBA, with hopes of a queen from Washington competing at the national level. 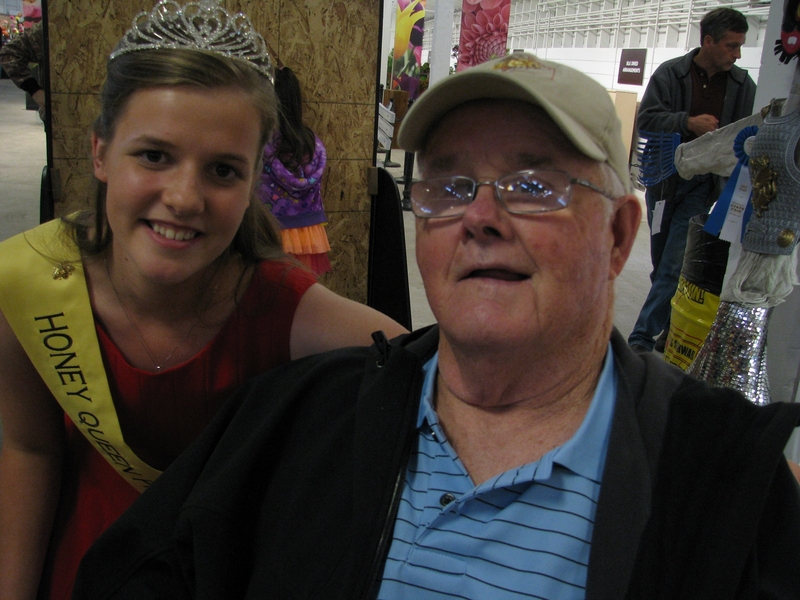 American Honey Princess Emily Campbell recently visited PCBA and attended the WA State Fair. Pictured: Princess Emily visiting Robbins Honey Farm. PCBA has a Honey Queen thanks to the hard work and dedication of John Timmons and Kris Urv-Wong, with the help and encouragement of Jerry Miller, Cathy McPeek, Franclyn Heinecke, and Perry and Marlene Bartram.